Please thoroughly go through all information mentioned in the application form prior to submitting your application. Confirmation of applications received will be subject to the Entry rules and guideline given herein. You may use a photocopy of the physical or a downloaded form to send in your application. NO GROUP ENTRIES will be accepted for the 25K Run category, only individual application will be accepted for the 25K Run. Applicants must submit their entries only via the Application Modes given in this form. No individual/group has been authorised to collect entries on behalf of the Event. DO NOT add 25K Run entries in any group. Such entries will be disqualified. Only individual applications will be accepted for the 25K Run category. Purchasing scratch cards does not guarantee entry to the event and the members of the group need to register online on using scratch cards before the registration end date or till the running spaces are available. Event promoters will close registrations as and when the running spaces are filled. Once scratch cards are purchased, it can only be used online for TATA STEEL KOLKATA 25K 2017 edition and till the time registrations are open or running spaces are available. Unused scratch cards cannot be returned or cancelled and the amount paid for purchasing unused scratch cards will be refunded after deducting processing fees of Rs 150. Before sending in your application, please check the following. Applicant meets the minimum age eligibility criteria for the chosen race category. Where any discrepancy is found in the application and documents submitted, the same will not be accepted. On entry confirmation, 25K Run and Open 10K run runners will be further classified into age categories for prize money. Champions With Disability: We recommend participants of Champions with Disability be accompanied by an attendant on race day. The attendant is required to fill in a separate form and submit the same along with the form of the Champions with Disability participant, marking the said form as “Attendant of _______ (name of champions with disability participant)”. No application fee is charged for the attendant. 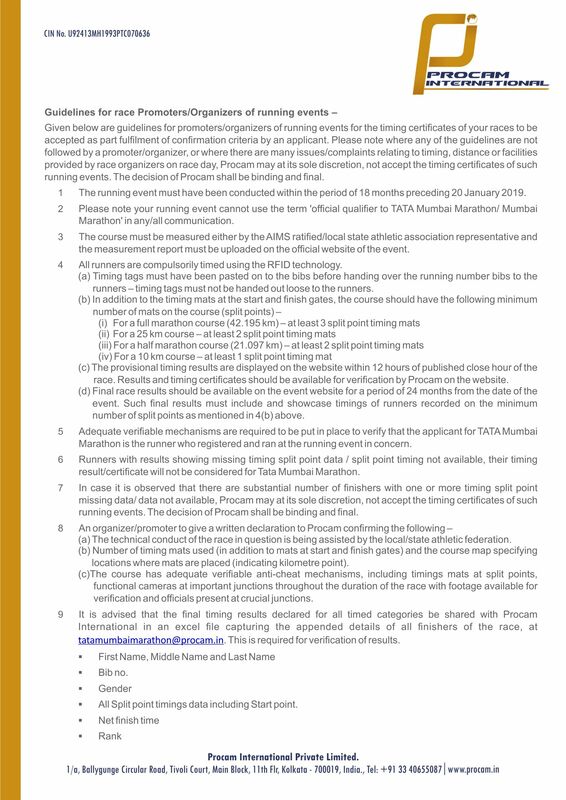 Application status: Post closure of registrations, individual applicant is required to go online on www.tsk25.procamrunning.in and check his/her application status. The applications status will appear online post 15 working days of submitting the entry form. In case of group entries (Open 10K, Ananda Run / Sr. Citizens’ Run / Champions With Disability race categories) , the point of contact of the group will be receiving email confirmation for confirmed participants of the group. If you are unable to check application status online, please contact our event helpline number +91 9867722855 or email us at tsk25@procam.in. Entries not accepted: Participation in the event is subject to entry confirmation. Where your entry is not confirmed for any reason, the application fees paid by you will be refunded on or before 31st January 2017. An amount of INR 100 will be deducted as processing charges. Any refund discrepancies must be brought to the attention of the Event Registration Team immediately. Refund queries will not be entertained post 31st January 2017. Confirmed participants of 25K/Open 10K who are unable to participate on race day due to unavoidable circumstances like injury or illness, will now be able to surrender their bibs to Procam International. The application fees paid will be refunded post education of Rs. 150 as processing charges. Confirmed participant can only surrender his/her bib with effect from 1st to 6th December 2018 by sending us a request mail at tsk25@procam.in. Requests for cancellation/bib surrender and thereby, refund will not be entertained post 6th December 2018 . Further, application fees shall not be refunded by virtue of non participation, including failure by a confirmed participant to collect his/her bib from the Expo. Authorised representative must carry with him/her a) the website confirmation downloaded from application status photocopy of photo-identity proof (Aadhar card, PAN Card or passport) of the representative and the confirmed participant. Confirmed runner’s identity and proof of residence may be verified by a verification agency hired for validating the details provided by you in the form. Where any information and/or any document provided by an applicant/runner at any point in time is found to be incorrect, participation of the said runner shall be withheld/ disqualified and there will be no refund of application fees paid by the runner. All benefits accruing to the said runner as a participant of Tata Steel Kolkata 25K 2018 shall stand forfeited.